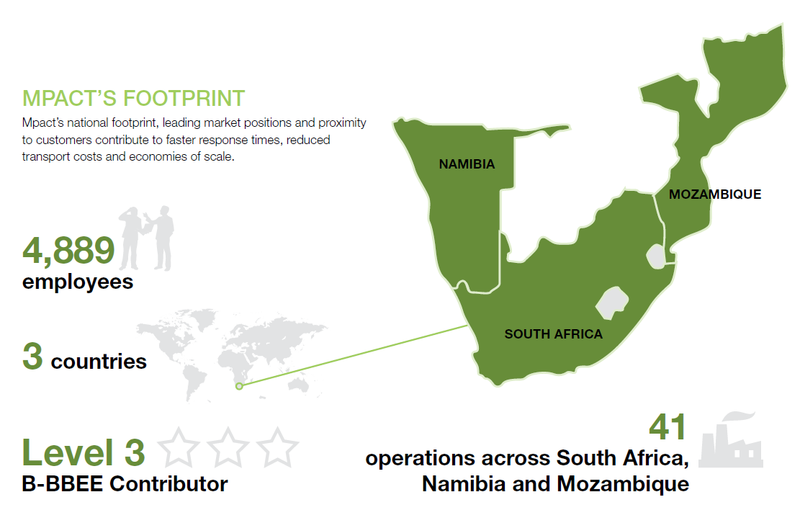 Mpact Limited, formerly Mondi Packaging South Africa, is one of the largest paper and plastic packaging businesses in southern Africa, with 41 operating sites, 22 of which are manufacturing operations, based in South Africa, Namibia and Mozambique. Mpact employs 4,889 people as at 31 Dec 2017. The Group, which listed as a separate entity on the JSE and demerged from Mondi in July 2011, has the leading market position in southern Africa in corrugated packaging, recycled-based cartonboard and containerboard, recovered paper collection, polyethylene terephthalate (PET) preforms, styrene trays and plastic jumbo bins. These strong market positions allow us to meet the increasing requirements of customers, achieve economies of scale and achieve cost effectiveness at our various operations. Approximately 90% of our revenue is derived from these product lines.